A little bird told me that you might be looking for a wedding gift. And especially unique gifts for bird lovers that are getting married. Sometimes it’s hard to find the perfect gift and not even know where to look. That’s why this fabulous selection of bird lover wedding gifts has something for everyone. Gifts for the home, kitchen and birding accessories are just a few wedding gift ideas. Have fun browsing and finding that extra special gift for your bird loving newlyweds. The bride and groom will LOVE a beautiful lovebird print to remember their glorious wedding day. One of the prettiest prints you will find with a heartfelt and loving message. 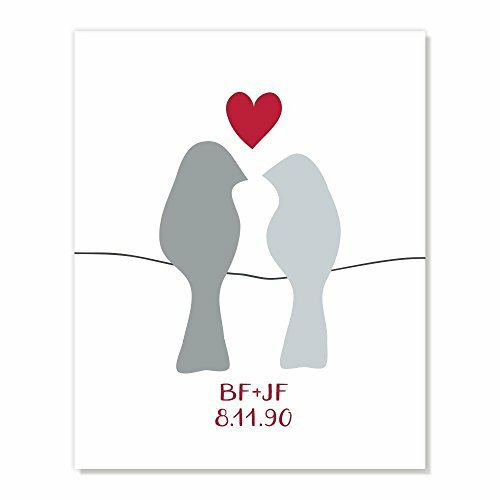 This sweet and simple print features two cute lovebirds with a lovely red heart over top. Personalize with initials and wedding date for a “WOW” wedding gift. Add your own frame and the newlyweds will have an extra special art print ready for hanging as they start their new life together. I would love to have a set of these and I’m not even a newlywed! A unique gifts for bird lovers set of bird plates that the bride and groom can use for appetizers, salads or desserts. When all is done, these quality stoneware plates can go right in the dishwasher for easy clean up. Of course they are so pretty, the newlyweds may choose to display them in an open cabinet or plate shelf to enjoy their color and beautiful details. For a bride and groom that loves birds, a bird feeder is a must-have wedding gift. 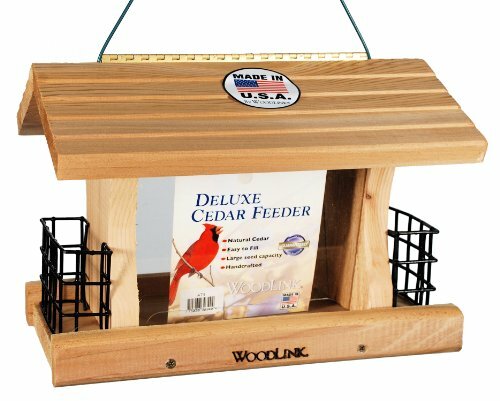 After researching many bird feeders currently on the market, this one has the best reviews, best quality and it’s made in the USA. Bird decor has a way of bringing cheer to a room and especially in the kitchen. I can hear the sweet little chirps already. Each gift is prettier than the next and put them altogether for a beautiful bird themed kitchen. All newlyweds need a pitcher for water, iced tea or lemonade and this one in a special bird theme is so gorgeous! The nicest sentiment is written on the side for family and friends to see. One that warms the heart and lets everyone know how much they are appreciated. This family and friends pitcher is one to cherish for dinners and family get-togethers throughout the years. Soft, beautiful and quality towels are a dream gift if you can find the right ones. 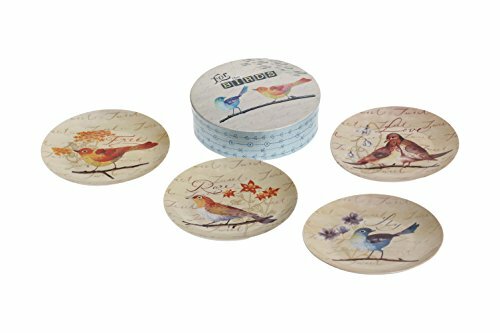 Add a lovely bird motif and these become one of the unique gifts for bird lovers. The bride and groom would love these towels in their master bath but wouldn’t they also be splendid in a guest bath or powder room? So many times I see fancy towels that cannot be washed and they are only decorative. Not the case with the Avanti Gilded Birds set. They are 100% cotton and completely machine washable. 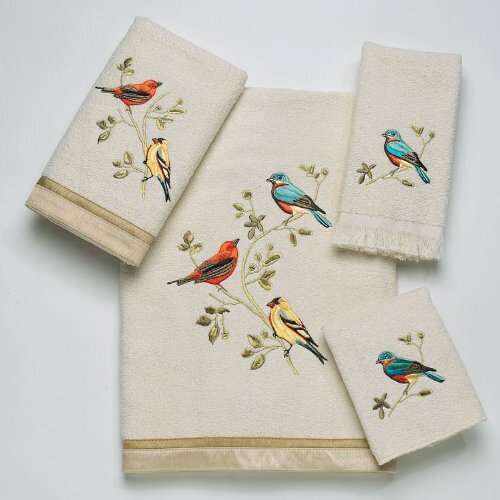 Pair these towels with more bath accessories from the Gilded Bird line. A lovely gift for newlywed bird lovers that enjoy spending time bird watching. 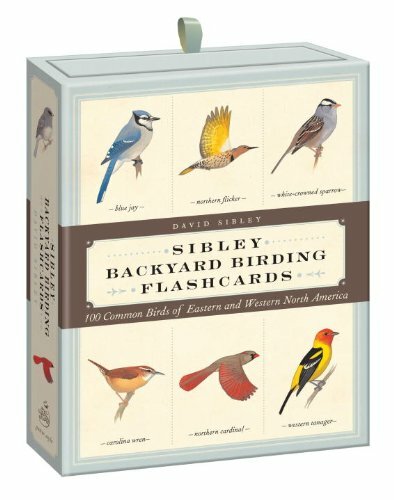 A fun and informative set of flashcards that will identify all of their favorite backyard birds. The design of the flashcards is nicely done with beautiful illustrations and descriptions of the birds without going overboard. The cards are neatly packaged in their own pretty box which keeps the cards all in one place and ready to go outdoors.